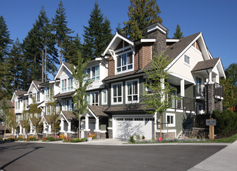 Cedar Creek Townhomes is nestled amongst some of the area's most exclusive communities - situated near the top of Coast Meridian Road in Coquitlam. These 3 and 4-bedroom townhomes will feature spectacular views, attached garages, enclosed yards, granite countertops, engineered hardwood flooring, and Bosch appliances. Update: As the best resource for all information about every development in the area, we regret that there will be no further information or updates available for the Cedar Creek Townhomes development on Burke Mountain. We have been asked by the Sales Manager of Cedar Creek Townhomes to remove any specific information regarding the development. We apologize for any inconvenience. Disclaimer: Rebecca Permack is an independent Realtor with Royal LePage West Real Estate Services. Although she works closely with many developers in the area, she is not directly affiliated with the developer or development, and does not represent them in any way.y.